When the security features of the electric garage door are not efficient, burglars can take advantage of the vulnerability of the garage entrance and invade your home when you least expect it. There are also criminals that can manipulate your security system and manage to use other remote control systems to gain access into your house through the garage door. 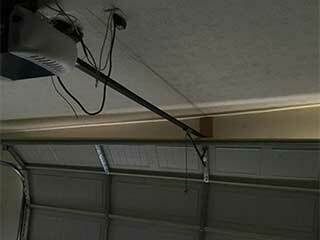 When an electric garage door opener fails to function, it can prevent you from going in or out of your garage. You will be forced to open the door manually, which kind of beats the point of having an automated system. A faulty door can also close unexpectedly and fall on you or on your car, and the severity of such potential accident can range all the way from minor to catastrophic. The good news is that these disadvantages of automatic doors can be avoided through various ways. First, you need to install a door that suits your house perfectly. We mean this literally. There should be no gaps left between the door system and the wall. Second, the installation must be carried out with extreme caution and precision. Not to brag or nothing, but our experienced technicians are masters at this sort of thing. You also need to make sure the your door has features that ensure both safety and security, which is something new opener models often come with. From backup battery systems to extra light sensors, timers and excellent garage opener remotes. You can also upgrade your existing system in order to feel safe. You need to remember that each property would require a special type of door, which would make your access convenient and safe. So, don't choose something just because your neighbor has one, but consider your own requirements and expectations and don't forget that regular garage door maintenance as well as immediate damage repairs will keep the system strong and your family well-protected.